“My business is my passion. 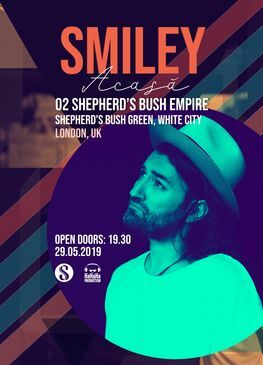 Everything I do is for HaHaHa Production.” Smiley is the biggest Romanian pop star of the moment... for over 20 years. That`s amazing in the music industry and he`s still in top charts in Romania. The latest album, #Confession, has over 175 million views on YouTube. “Vals”, one of his best songs was the most played radio hit of the year. Smiley is an artist by every means, a passionate producer and an incredible composer. He`s also an outstanding entertainer. His entire life was about music, but Romanians know him as a charming entertainer too. Smiley is the longest coach of Voice of Romania, winning 3 out of 9 seasons. He copresents the greatest show out there: Romanian`s Got Talent. There is no music career greater than Smiley`s. He won to many awards to count, alongside with 5 Platinum Discs, Fastest no. 1, Artist of the year, Album of the year. He started his music career 20 years ago, with Simplu, the most surprising Romaniand band. The last 10 years were dedicated to his solo journey, and he feels like this is just the beginning. In seara evenimentuui biletele electornice vor fii schimbate cu bilete fizice la casa de bilete.